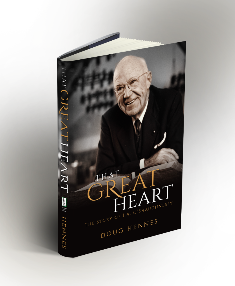 More than four months after launching his first book, Doug Hennes, is still receiving press for his bestselling book, That Great Heart: The Life of I. A. O'Shaughnessy, Oilman & Philanthropist. It's all happening because his book tells a great story of a great man who had a great impact. Enough greatness? Yes, but sometimes press comes when you can make a connection to why this story matters. And this article, one of many, makes the connection about the legendary Oilman and philanthropists connection to St. Paul, Minnesota during the traditionally Irish time of year, St. Patrick's Day. Take a moment to read this story and see how a mug of beer and the ability to tell the truth changed one man's direction.